Beginning with his rookie year in 1960, Oscar Robertson averaged a triple-double through 1965. He was the league MVP in ’64 and the All-Star Game MVP in ’61 and ’64, and never failed to make First Team All-NBA through the ’69 season. This is Robertson’s plaque which recognizes his selection to the 1966 National Basketball Association All-Star Team as presented by The Sporting News. 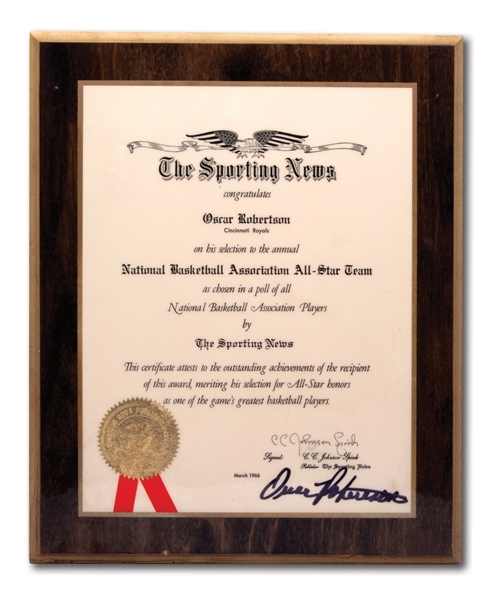 Measuring 11.5” by 14”, the wood-based award features The Sporting News logo at the top and gold seal at the bottom left. Making the award all the more impressive is Robertson’s autograph in bold black marker at the bottom right. The award is dated “March 1966” at the bottom and is even holds the laminated black ballpoint signature of then-publisher C.C. Johnson Spink, who inherited the prestigious publication upon his father J.G. Taylor Spink’s death in 1962. (The grand-nephew of Alfred Spink, who founded The Sporting News 1886, would be the last of the Spink legacy to run it). The plaque shows some wear from age and displays nicely. A visually attractive piece from the middle of The Big O’s Hall of Fame career. Includes LOA from Oscar Robertson.